In preparation for the Festive season parties I started to look at recipes that would be suitable to serve as canapes (cocktail snacks) or starters over the season. One of my favourites is Gougeres, these are savoury choux pastry balls. Whilst they do take a little work to prepare, the taste of the savoury choux pastry is always a pleasure and you can fill them with any filling you like. There are many recipes, but the core of the Gougeres is the choux pastry. A secret is to make sure each egg has been properly beaten into the dough mixture prior to adding the next one. I used a traditional French recipe but I added a tip from Alain Ducasse, the great contemporary French chef, he adds a pinch of nutmeg, I think this is a great idea. I included some 26 months matured Beemster XO instead of Comte or Gruyere. This strong, dry cheese heighted the flavour of the pastry. I made a filling of smoked salmon roses and mixed in some chopped salmon with cream cheese. 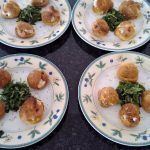 The recipe is really easy, it just requires a little bit of extra care especially when baking the choux puff balls that they are properly cooked and dark golden. They should be dry and crisp, leave them to cook longer if they look a bit pale. You can turn off your oven after cooking them, then leave them to cool down in the oven with the door open, as this will help the pastry to dry out. Gougeres can be made in advance and frozen. You just need to crisp them up a bit in the oven once they have defrosted which is ideal when you are planning your party in advance. I recommend pairing these Gougeres au saumon with a Rust en Vreede Viognier. Put dough in a bowl and leave to cool for 1 minute. Once cool slice the top of ball, centre should be hollow. Cut the rose about a finger width long from the thickest end of the cigar and set on its base. Cut a second rose from the cigar. You will be left with the second half of the cigar. Chop up all the rough ends of salmon and mix in a bowl with cream cheeses, ground black pepper, half the lemon zest and the balance of the capers. Mix until sauce is creamy. Place on a serving plate and sprinkle rest of zest plus some dried origanum from Crete over the Gougere. If you are serving as a starter, I recommend you add a small green salad to the centre of the plate and arrange 4 gougeres around the salad.